Anyone who watches The Simpsons may get the joke in the title here. 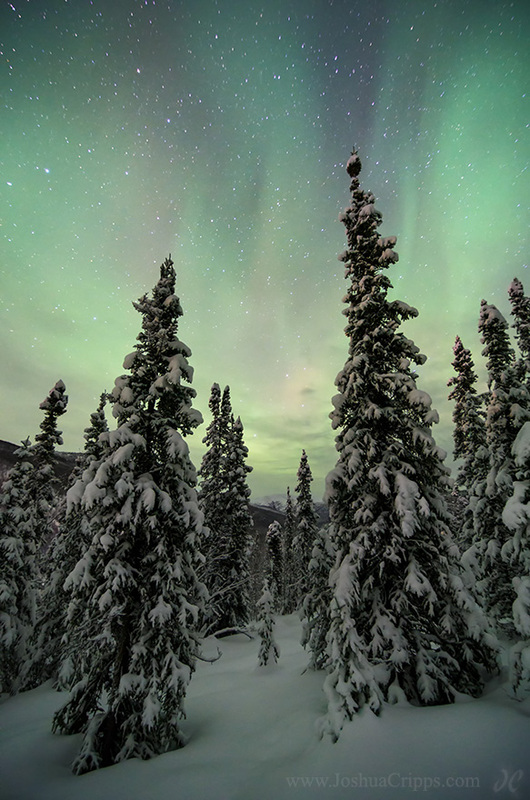 In early January I had my first real experience photographing the aurora borealis. I was visiting Chena Hot Springs near Fairbanks, Alaska for New Year’s and on January 1st a decent show sprung up. As soon as the glowing bands appeared in the sky I dashed out of the hot springs and kitted up to face the -10 deg night. Tromping uphill away from the lights of the hot springs resort as fast as my swaddled legs would carry me I found this patch of spruce facing in the same direction as the aurora. Standing thigh-deep in the snow I set up my camera for a series of long-exposures, the 30-second shots bringing out the color and forms in the sky.